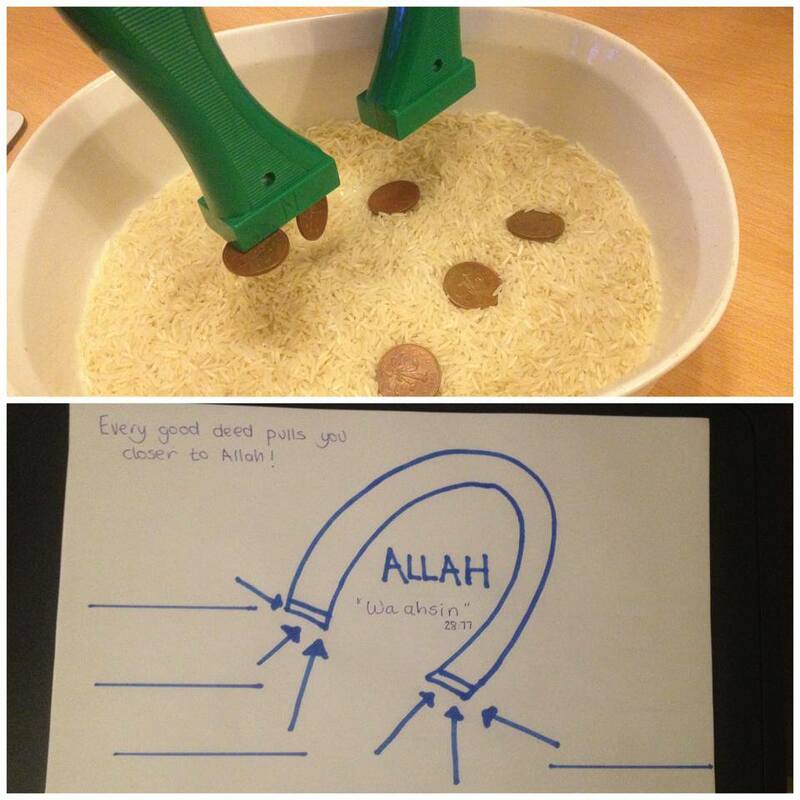 Check out this awesome idea to make the reality of doing good deeds come alive for children from Islam From The Start! As the month of Dhulhijja is extra special for doing good deeds, we had a introductory lesson and a fun activity to show us how good deeds bring us close to Allah. Lets imagine that good deeds are like magnetic objects and Allah is like the strongest magnet ever! Take a few 1p/2p coins and for each coin, have the child say a good deed and place it into a box of non-magnetic items/rice. Use a magnet and show how the good deed coins are pulled up by the magnet! -Point out how there is no such thing as a ‘small’ good deed, all the coins were magnetic! – It doesn’t matter if no-one saw you do the good deed. Even coins hidden at the bottom of the pile were pulled up by the magnet. Every good deed is seen by Allah and pulled towards Him! Use the next 10 days to become familiar with the Quranic phrase, “Wa ahsin, do good”. Fill out the magnet worksheet by writing one good deed done each day. Remember, every good deed brings you closer to Allah!